Reference number for this case: 14-Oct-54-Antibes. Thank you for including this reference number in any correspondence with me regarding this case. Another series of observations of the meteor of October 14, 1954, at about 06:10 p.m. in this region; which had been interpreted as a "luminous machine". 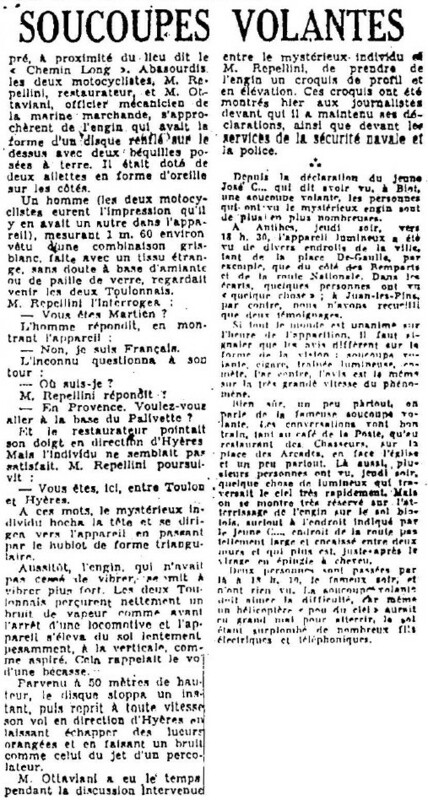 [pa1] Article in the regional newspaper Le Patriote, France, October 17, 1954. 1.0 Patrick Gross January 10, 2017 First published.